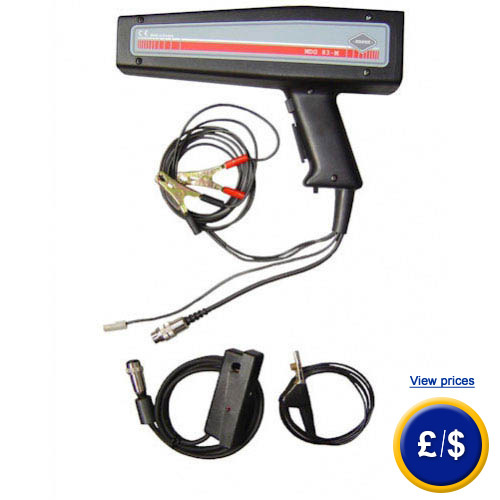 An ignition point gun can be used to detect the ideal point for ignition in areas of auto mobiles. The ignition point gun is preferably used to adjust the ignition of older engines. When such old engines ignite early, it can lead to a heat-up of the engine at higher rotational speed. That’s why it is important to check the ignition setting of older engines every thousand kilometers and, if necessary, to calibrate it. In order to do this, the ignition point gun is clamped to the engine battery for power supply. For further information about the ignition point gun, please read the following technical data or use our hotline: UK customers +44(0) 23 809 870 30 / US customers +1-410-387-7703. Our engineers and technicians will gladly advise you regarding the ignition point gun MDG83M and all other products in the terms of regulation and control, or scales and balances of PCE Instruments.